Oh my Goodness, Another challenge which means another week has gone by. Where did January go? We figured today that Wednesday is exactly half way thru the school year. (here in Northern California)which means, 90 more days of school. That is too weird. It seems like just yesterday was the first day of school. Time flies as we get older! Anyways, Onto another challenge. 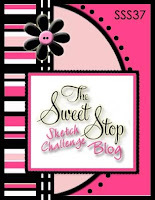 This one I did is from The Sweet Stop challenge Blog. They have totally fun challenges every week and I just love when I can finish one in a night. Happy Sunday everyone. I am actually ok with it being Sunday because this is a 3 day weekend which means I don't have to go to bed early cause I can sleep in tomorrow! Can we say Yayyyyyyyyy!! Tonight I completed yet another sketch challenge. This one is from The Sweet Stop. They always have fun sketches and this one was no exception. This one was with a twist. Our focal point had to be a Sentiment. The only issue I had was deciding on which sentiment to use. So, I decided on "One good friend is better than ten bad ones" So, tell me what you think of my creation. here are the supplies used: DP from My minds eye,build a brad (in the middle of the flowers) from Stampin Up! Prima flowers,Close to cocoa and whisper white card stock. Stampin up! Scallop trim border punch from Sell a Bration. Enjoy my friends and I will see you all real soon! Here I have another completed sketch for you. This one is from Sweet sketch Wednesday Another Valentines day card. The stamp set I used on this one is "Love you much" from Stampin Up! I heat embossed the love in red embossing powder. The DP used is from We R Memory Keepers and is a double sided paper so I totally loved this paper. My color scheme is Summer sun,Bermuda Bay,Postitively Pink and white. I used my Nesties in the scallop circle and also used my ticket corner punch on the DP. I used a yellow bling brad from my stash as the center for the 2 flowers in pink and turquoise dots. Oh Valentines day is so fun! All the Pinks and reds just make me so happy! Happy Friday all, Oh, I am so Happy it is Friday! A weekend of just relaxing and not having to worry about being anywhere at any given time, YAYYYYYY! So, with that being said, Last night wasGina's Monthly stamp campand I totally look forward to these every month. Stamping and chatting with some really great people and learning new techniques that WOW! We made a total of 6 projects and all of them are so darn cute I just have to share! First one is a set of 4 Season themed calenders. Gina had 4 cards each with 3 months on them with the season at the top! The next project was a card using the faux metal tag technique(I think that is what it is called) Isn't the little doggie cute? The next project is an adorable little mail box with 2 Hershey's nuggets inside. Look at that little flag. All set for Valentines day! Hello all, Well here I am with a new completed challenge. This one is for "The Sweet Stop" Sketch challenge blog. This was a fun challenge and I decided to pull out one of my neglected Bellas to use on this creation. Her name is "Emmybella" My color scheme was Post. Pink, Green Galore and black. I love pink with anything. I colored Emmys pants in with my Copics and her shirt with one of my Gelly Pens. The green bag was with green Spica and also her purse with a gelly pen. I added some Pink and green ribbon from my stash and the prima flowers in green polka dots and pink. The DP is from Debbie Mumm and you cant see it too well, but there is embossing in the pink and green lines on the DP. I also used my D'vine swirl EF to add a little texture! Off I go to a stamp camp, I so look forward to these every month. I will share our projects that we create with you all tomorrow!